Last month I wrote about the discovery and predicted spread of the Asian hornet (Vespa velutina) once (if) it gets established in the UK. The National Bee Unit (NBU) and DEFRA have today (26th September 2017) reported the identification of an Asian hornet in the Woolacombe area of North Devon. This is about 100 miles from the Tetbury site (near Stroud) where the Asian hornet was isolated in September last year. There was an additional isolation in North Somerset in autumn 2016, though the precise location was not publicised. Genetic analysis by the NBU will determine whether the new isolate is related to previous isolates. This would imply, though not prove, that the hornet may be established and breeding on mainland UK. I’m speaking at the Devon Beekeepers Convention in Totnes next month and expect to hear more about efforts to track down and destroy the (or nests) at the meeting. The Asian hornet appears to now be established on Jersey in the Channel Islands. This entry was posted in Beekeeping, Invasives on September 26, 2017 by David. Interesting that for us the Asian hornet population has tumbled this year. Last year it would have been unusual not to see several hunting in front of the hives at this time; so far this year I have only seen one or two and I certainly won’t be worrying about the number of bees they might take this year. I did meet a colony nesting in a breeze block in a building where we keep sheep and was unfortunate to get them excited – v.v.painful, but the pleasure of exterminating them somewhat made up for it. That’s good to know Guy. I wonder whether it was a result of targeting nests last year before the new queens departed, or something like a particularly poor Spring or hard winter that you have no control over? Any ideas why we seem to be finding them so late in the year? Not really any later than last year I don’t think. I think bees make a tempting target late in the season when the hornets are rearing new queens and they need a protein-rich diet. They’re generalist predators but the lure of 50,000 largely defenceless honey bees must be very tempting when you need a lot of protein in a short time. Since there are still leaves on the trees it’s likely that spotting the nest(s) will be difficult. This is a worrying revelation, keep us all updated with your findings when in Devon next. I should imagine that Devon is now saturated with Seasonal Bee Inspectors and the news will be widespread well before I get back from the meeting in Totnes. However, should I manage to find anything interesting out I’ll post an update. The key things is the genetics … if this one is related at the maternal or higher level to the isolates last year then it’s reasonably certain they’re established in mainland UK. There remains a possibility for multiple, related imports, but it’s clutching at straws. All the colonies here treated and just about wrapped up for winter now. All reassuringly heavy. However, the weather remains good and there’s still quite a bit of foraging going on and, going by a quick peek in a couple of boxes and the amount of pollen going in, lots of brood still being reared. Varroa levels are really low which is always pleasing. Let’s hope for a short, really hard winter and an early Spring. Colony development often isn’t advanced enough to properly exploit the OSR up here. Yes … and the rate of spread seen in France suggests it won’t be too long before it’s widespread I’m afraid. It’s interesting to note that the recent study predicting spread of the Asian Hornet has a red dot very close to Woolacombe (check panel D of the the figure showing the map and confidence limits), though that was 5 years after introduction. If the most recent isolate (now possibly isolates, as there’s now a report from Plymouth as well) is distantly related to those from last year we can be pretty certain that the hornet arrived in 2015 and has been spreading since then. An interesting viewpoint Bo … and probably not one that would be shared by the beekeepers in France, Portugal and Spain who are already struggling with Asian Hornets. I certainly don’t disagree that these are fascinating insects … any hornet, European, Asian, Giant etc. 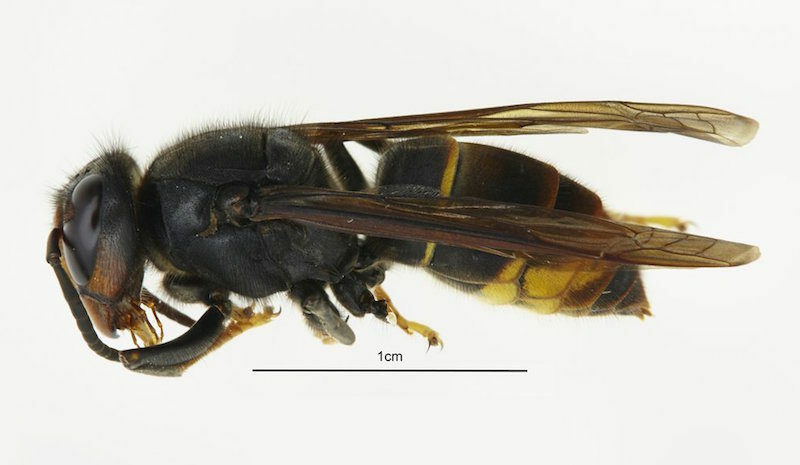 However, “nature taking its course” in this context is wrong as the Asian Hornet was an inadvertent import to France. Apis mellifera hasn’t had the opportunity to evolve (and won’t in your lifetime, or mine, or anyone reading this) to cope with AH’s … in the same way that they can’t cope with Varroa despite ‘living’ with them for 100 years. I suspect the AH arrival in the UK will be less devastating than many predict, but I certainly don’t think we shouldn’t try and control it. I presume you mean eradicated, not irradiated?! Most here have yet to deal with Asian hornets, so the scale of the problem has yet to be appreciated. When I lived further South I used to like seeing the odd European hornet around the hives. It was only a few times a season and they were always stunning insects. I certainly didn’t trap or kill them. Selective trapping – or selective use of the badminton racket – may be the best way to deal with AH’s though I’m aware others are developing crafty mixes of fipronil and custard. There’s currently no news of additional discoveries that I’m aware of. However, I’m off to Totnes next weekend to speak at a weekend Beekeeping Convention so there may be some ‘local’ news of relevance.